First, I need to warn you that this is very long. I’m sorry. Turns out I’m the emotional, creative type that processes with long-winded blog posts. Second, I need to warn you that at the end of this post does not end with a baby. It’s because I could not possibly fit any more words into a single post. Please do not throw tomatoes at your computer monitor. 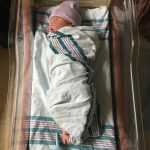 Occasionally during my pregnancy someone would tell me they were excited to read this baby’s birth story — particularly since we knew it would probably be fast, and that always adds some drama. But it’s childbirth and no one really knows what to expect, so I would respond, “Hopefully she’ll give me some good content!” Because a labor in which contractions start, you have plenty of time to get to the hospital, and then you have your baby in predictable fashion — who wants to read about that? Ahem. Hopefully you. Because that’s basically what happened. Hold on to your chairs. Let’s begin on Friday, November 10. I had a normal morning of kindergarten and preschool drop-off, and then an OB appointment. My mom had arrived the day before, and when she did, I shed approximately 39 weeks of worry and angst about being alone and having to find childcare while fully dilated. My mom was planning to stay for the long-haul, even if I went overdue, as I’d predicted, and remained pregnant until 2028. Immediately she took over lots of my daily routine — getting David from the bus stop, helping the kids brush their teeth and put on shoes — and did things like wash dishes and pick up toys. I realize this makes me the lamest middle-aged mom ever, but it was more relaxing than a beach vacation. SHE CLEANED UP LEGOS! At my 39-week appointment my doctor told me I was 3 cm, about 50 percent effaced (which I had been for two weeks) but that the baby was still very high. She said she was pretty sure I’d hit 40 weeks. Every pregnant woman knows exactly what that means. It means you’ll be pregnant forever. And ever. Amen. The next day was marathon day. It was an early, freezing cold, windy, morning. We all had so much fun, but after spending the morning on my feet, shivering in a coat I couldn’t zip, I was exhausted and sore. More so than my husband, who actually ran the race. He agreed. Partially because it would have been unsafe for him to argue. But also because IT’S TRUE. And why is everyone SO QUICK to compare other forms of pain to childbirth? And not just compare but TRY TO BEAT. Woman: I’ve had four unmedicated childbirths. Stranger: I’VE HAD SIX KIDNEY STONES, RUN SEVEN MARATHONS, AND ONCE I STUBBED MY TOE! HA! 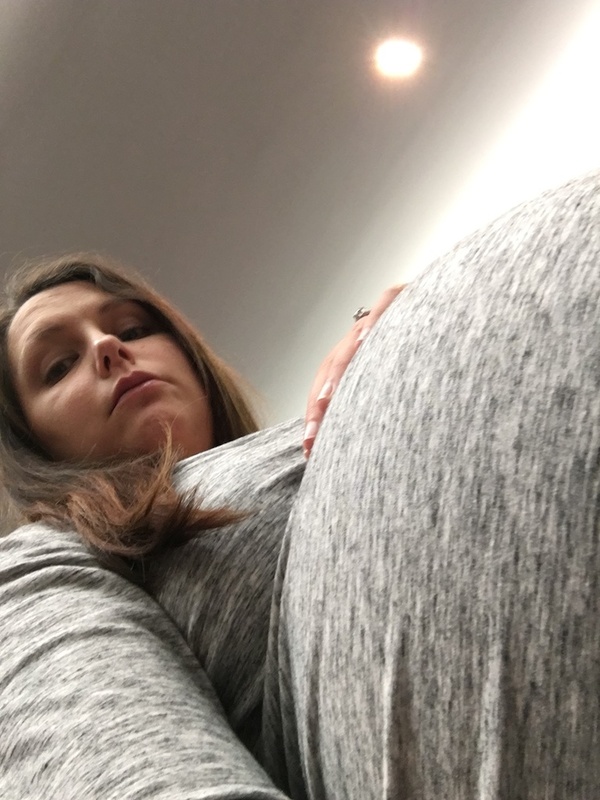 As I tried to fall asleep, I was feeling very, very pregnant and uncomfortable, and I started thinking about the week ahead — week 40 — and potentially the next two weeks if I went past my due date. A peculiar thought popped into my mind — I CAN DO THIS. 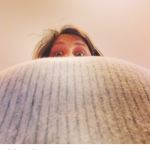 I’m not prone to optimism, or even realism, especially when I’m pregnant. I sit squarely in the pessimistic, “I will be pregnant forever and everything will be awful” camp. But without warning, a ray of light poked through my storm cloud. I CAN DO THIS, I told myself, because I’ve done it before. My mom was helping, Tom had taken on as much as he could; my biggest responsibility was putting on my maternity jeans. I could handle that for another week…right? I rolled over and looked at my husband, sleeping soundly. He’d raced 13 miles that day, mowed our grass, and on top of that, watched an incredibly stressful Virginia Tech football game. I considered waking him, but hesitated. He needed sleep. And what if I woke him up to time what ended up being my very active bladder? I went to the bathroom, got back in bed, and waited. I have no idea how much time passed, but at some point I felt another cramp. It could have been 10 minutes or 30, or 5. So what now? NOW do I wake Tom? 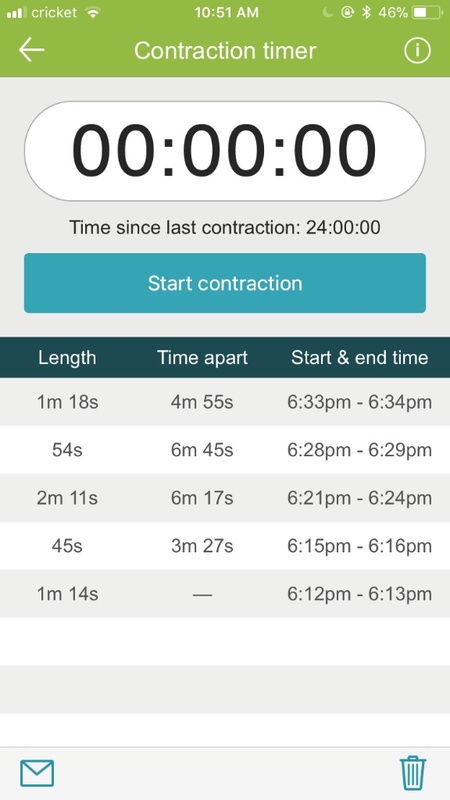 Should I try to track the contractions? Or try to go back to sleep? 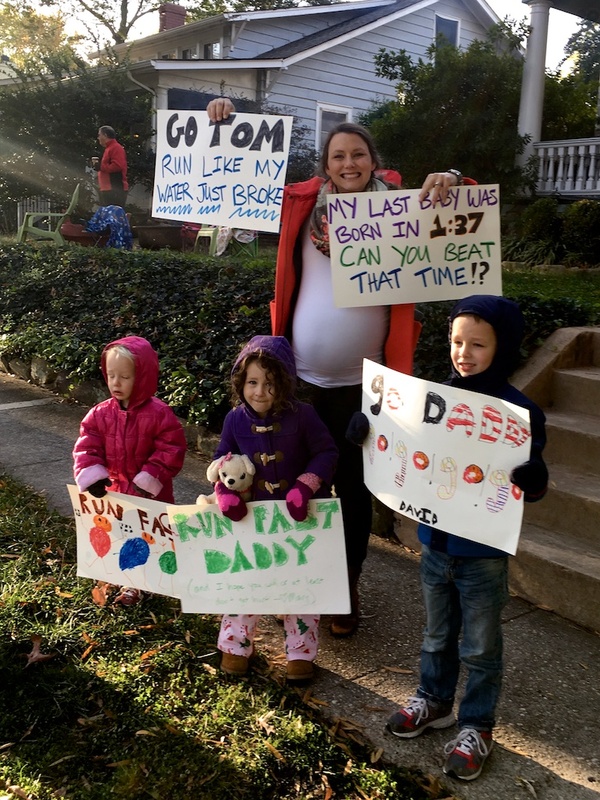 After reading the very helpful article, I decided that what I was feeling were Braxton Hicks contractions that felt intense because of middle-of-the-night irrationality, coupled with soreness from all that enthusiastic cheering I did the morning before. Either that or labor had started and I was setting the stage for having a baby in my bathtub. I decided to go back to sleep. Tom didn’t take it casually, and in a voice he usually reserves for telling Thomas to get off the roof, he told me to ALWAYS tell him if I think I’m in labor, please, Dear. As you’ll read, I only sort of took him seriously. I really wanted someone to tell me what they thought. Even now as I write this, I still have no idea what was happening. Was it early labor? 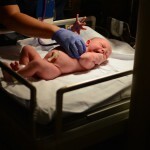 Prodromal labor? Just the general discomfort of being 39 weeks and three days pregnant? A friend texted me and asked me how I was feeling and I responded with this picture. 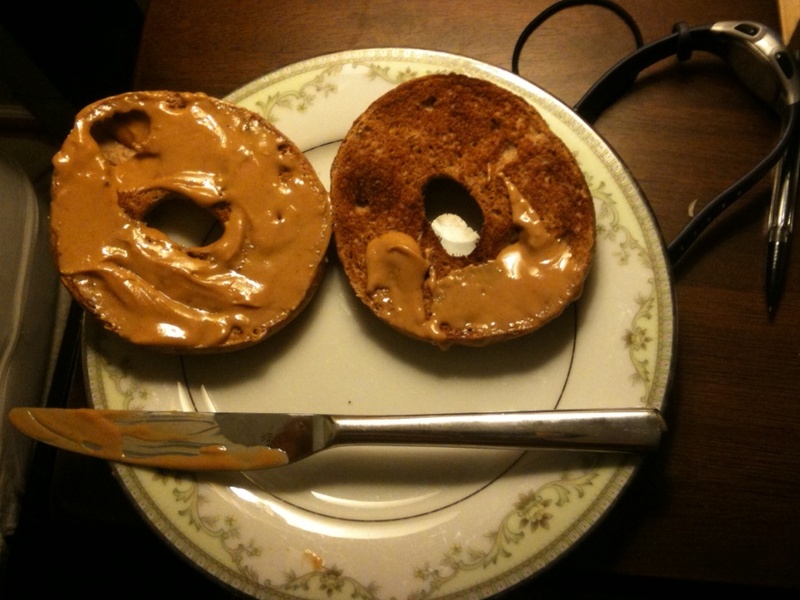 I know what you’re thinking. Look at those split ends! She — and this is really what happened — filled my plate with kale and told me to drink some water and relax. We were having Tom’s family over later that evening for his birthday, and all I needed to make a pie and wrap his presents. I felt distracted all afternoon, and tried to glance at the clock whenever I felt a contraction. I guess we can call them that now? Except, even though there is currently a baby sleeping on my chest, I still don’t fully believe I was in labor. Denial, turns out, is my main labor symptom. The contractions were incredibly irregular; I started looking at the clock but there was no pattern, and they weren’t increasing or intensifying at all. I sort of blundered my way through making the pie. The crust was over-worked to a consistency of Play-Doh, I forgot a few ingredients in the filling, and when I put it all together the crust fell apart and I just smashed it into the dish. THAT’LL DO! I thought. And then I went to rest on the couch. For dinner we ordered food from Peter Chang’s, Richmond’s world-famous Szechuan restaurant, and by the time Tom’s family arrived around 4:30 p.m., I was mostly just awkwardly sitting on the couch, trying to figure out what was going on. These Braxton Hicks? They had a bite. I remember thinking, “Even if I’m not in labor, something is happening.” Which is a weird train of thought, I know, because what else could have been happening? I just wasn’t ready to admit I was in labor, after all, I was preparing to go past my due date! I CAN DO THIS, remember!??!! Tom’s entire family was over, and instead of drawing attention to my MAYBE IN LABOR status, I was kept a low profile. Usually I love to be in the middle of the action, the center of attention, and what better way to get a LOT of attention than to declare that I might be in the process of giving birth to the seventh Krieger grandchild!? Labor does strange things, apparently, because not only did I not want attention, I didn’t want to talk about anything or be near anyone. I sat quietly on the couch while everyone gathered in the kitchen. “That’s right.” I told him. “Let’s pretend it’s not happening.” And I made a mental note to update my birth plan — let’s just all pretend like nothing is happening. Then I told my sister-in-law, who’s had three babies, hoping maybe she’d be able to, I dunno, tell me what to do. You guys, NO ONE HESITATED. If you are 39 weeks, 3 days pregnant and you tell people that you’re pretty sure you’ve been having contractions, everyone responds the same way: YOU ARE PROBABLY IN LABOR! Immediately everyone got very, very excited and encouraged me to track my contractions. No, no, I said. I’m fine. These contractions aren’t that strong. I am just being dramatic. 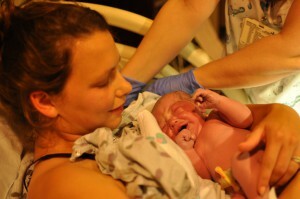 Also, have I mentioned, it was FOUR DAYS before my due date. FOUR! I was going to be pregnant forever! Not four days early! Even though I was very clear that NOTHING WAS HAPPENING, everyone kind of forgot what they were doing and started buzzing around the room in excitement. I’d spent the past nine months worrying about precipitous labor. But this was different! It felt so different than Thomas’s labor! When I left for the hospital to have Thomas I was having contractions that I couldn’t walk or talk through. These contractions were still so mild that no one had even noticed. I told everyone to stop acting like I was going to have a baby that night, and to eat. But I didn’t want to eat, no, thank you, and — HOLD ON A SECOND, HERE COMES ANOTHER ONE! By the way — another no-fail sign of labor — Amanda refuses Peter Chang’s. 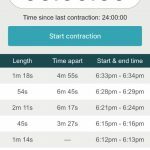 Tom agreed to eat on the one condition that I please, please track my contractions. I rolled my eyes and agreed. Ok, FINE! I’m in labor. Let’s go to the hospital. Tom immediately jumped up from his chair and started running in a lot of directions. He didn’t even mind not getting a slice of birthday pie. Part two is coming! As soon as I can string together a few minutes between telling the big kids to stay away from the baby. I always look forward to these Amanda! Every time I read your blog in general, I think “what a treasure she is making for her family.” Enjoy your sweet Anna Leigh! what a kind comment! thank you jenn! Do you ever look at the children sitting next to you today, and then the pictures from their births, and think about how it all passed so quickly?